Sometime between 1996 and 2002, the concept of the video arcade finally died out completely. There were no flowers or heartfelt eulogies. In fact, its demise was so ignoble that it's essentially impossible to put an exact date on it. 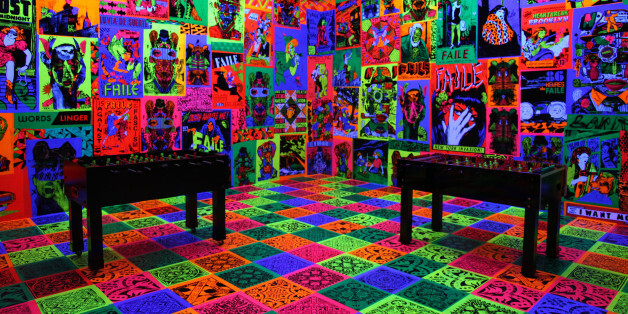 FAILE may be a religious experience this summer at the Brooklyn Museum, but only one of the hallowed installations is called "Temple." The seedier, more dimly lit venue will surely have the larger number of congregants by far, bless their sacred hearts. Turns out the kiddie empire has some highly unexpected cameos in its past. Play the new shooting game on HuffingtonPost! It pits you and your trusty shotgun against a relentless onslaught of insane shapes. 21 Tiers of shape shooting, particle blasting, power-up grabbing madness! Shoot the enemies, collect the ammo they drop, line up combo's and move through all 21 tiers of action. Join lots of people all over the world in this active and fresh space adventure! - Try new shooting game! The hottest Geometry Wars-style action seen in a Flash game! Shoot those space mutants. Your aim is to shoot on pips around you and not to let them ram your ship!